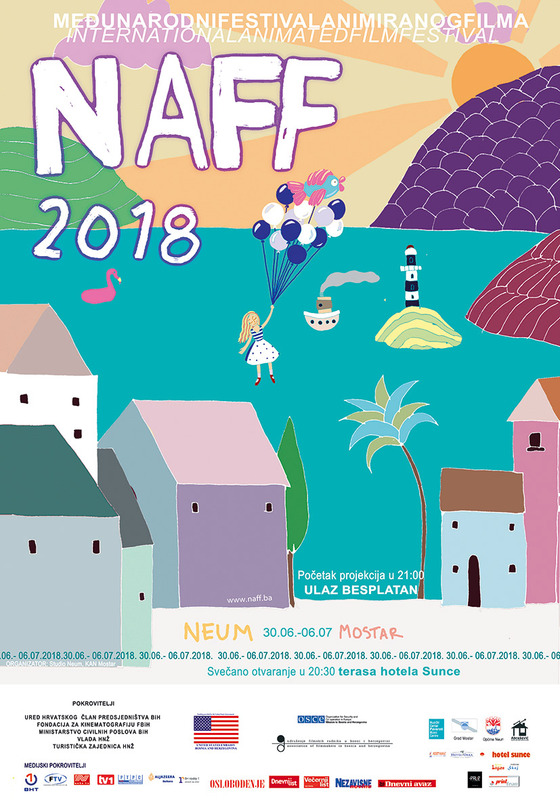 International animated film festival NAFF 13th opens on Saturday night, June 30th, at hotel Sunce in Neum. “This year we have received over 1000 film submissions from 64 countries which is a record number of film entires so far”- said the artistic director of NAFF, Mr. Jurinko Rajič. “Once again this year, authors from all over the world will come and visit the festival; USA, Ireland, Poland, Croatia, Germany, Belgium and many other countries. Quality of the festival program can easily be based on the random fact that this year we have had 76 film submissions from France alone, which we are particularly proud of.” – added Mr. Rajič. Competition program includes 56 animated films whereas Panorama program offers 17 films. Aside from film screenings in Neum, NAFF provided the same competition program projections which will be simultaneously held in Mostar at two different locations; Pavarotti Center and OKC Abrašević. “The most important thing in all these years that NAFF has left behind is the fact that a great number of young people have had the opportunity to educate themselves which is why I invite everyone to come and watch film screenings here in Pavarotti Center.” – stated Mr. Elvedin Nezirović, director of Pavarotti Center. Entrance to all screenings is free of charge, and the festival is supported by high sponsors such as; the Croat member of BiH Presidency, Mr. Dragan Čović, Federal Ministry of Culture and Sports, Fundation for Cinematography of Federation of Bosnia and Herzegovina, Ministry of Civil Affairs of BiH, Tourist Board of Herzegovina-Neretva Canton, Association of filmmakers in Bosnia and Herzegovina, United States Embassy and OSCE Mission to BiH. Jurinko Rajič said that in his 12 years of NAFF activity, not one author had asked for a financial compensation for screening of their film. In other words, all those films (700-800 of them) have been given to the festival projections for free in service of animation propaganda and even more so- allowed to screen freely throughout the whole year. Sponsors of NAFF are the following: Croat member of the Presidency, mr. Dagan Čović, Federal Ministry of culture and sports, Fundation for cinematography of Bosnia and Herzegovina, HNŽ government, Tourist community of HNŽ and American Embassy to BiH. Partner of the festival is OSCE mission to Bosnia and Herzegovina- said Sanja Rajič Banjac, the festival producer.